Porcelain embryo and larva, which measure approximately 0.8 - 1.15 mm in length/diameter. (Phys.org) —As the world's oceans soak up carbon dioxide from an atmosphere increasingly polluted by fossil fuels, seawater will become more acidic. Two new studies by San Francisco State University students suggest marine animals like the porcelain crab may not thrive over the long term under these highly acidic conditions. The porcelain crabs studied by Lina Ceballos-Osuna and Hayley Carter, former master's students in biology professor Jonathon Stillman's lab, might be expected to be somewhat resilient to fluctuations in ocean acidification. 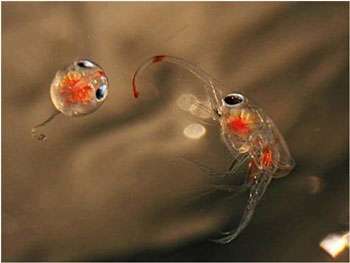 Their life cycles carry them from tidal pools of varying acidity as embryos, out to the less acidic open sea as larvae, and then back to the intertidal region as juveniles and adults. But in painstaking lab studies, Ceballos-Osuna and Carter found that low pH conditions—like those predicted for the open oceans in the next century—had significant effects on the early life stages of the crab. "Lina and Hayley had to figure out the best way of acclimating crab embryos, larvae and juveniles to different pH conditions, which involved a lot of aquarium time and ingenuity," said Stillman. "They each overcame great challenges due to the small size of the early life stages in measuring a wide array of physiological responses, including survival, growth, metabolism and energetics." The embryos' metabolic rate dropped under acidified conditions, and the low pH acidic water also reduced heart rate among embryos and larvae. Crab embryos did not increase in size as they would under normal water conditions. Survival rates among juvenile crabs dropped 30 percent after 40 days of exposure to acidic water. These changes suggest the crabs have several mechanisms they can use to tolerate short-term changes in acidity, such as the changes they might encounter during their travels from the intertidal zone and back again. The researchers say these mechanisms would not necessarily be good adaptations to the pervasive ocean acidification predicted for the year 2100 and beyond. Sustained over a long period of time, the changes could rob the crabs of the energy needed to grow and reproduce. The students and Stillman had to devise careful experiments to study the crabs after retrieving pregnant females and juveniles during low tide at the Lindamar beach in Pacifica, Calif. The embryos are no bigger than a poppy seed, and the larvae are covered with tiny barbed spines that can latch on to lab equipment. The pH of seawater in the intertidal zone where the crabs were retrieved can vary considerably, said Ceballos-Osuna, who now works at the Smithsonian Institution Research Center (SERC) studying invasive species. "When the tide goes out, the water mixing in the tide pools is really low, and there are chemical and physical changes in the water" caused by changes in temperature and salinity, plant photosynthesis processes and animal respiration. The researchers kept the broods from different mothers separate, which proved to be an illuminating choice. In both studies, Ceballos-Osuna and Carter found that different broods responded differently to the acidified water. Some broods were less likely than others to show changes in metabolism as a result of acidic stress, for instance. It is unclear yet why these differences might exist, although Carter said the reasons could be both genetic and environmental. "It's possible," she said, "that mother crabs exposed to stressful conditions like high temperature or water salinity could pass on fewer nutrients to their offspring, making them more vulnerable to acidity." "Porcelain crabs don't move a lot once they settle, so they are exposed to a microenvironment during all their adult life," Ceballos-Osuna agreed. "These local environmental conditions will determine the energy that the parents allocate to their offspring." "It is also possible that mothers who occupied lower pH tidepools—tidepools higher up on shore that are isolated for longer periods during low tide—prior to egg production may produce embryos that are more tolerant of low pH," Carter suggested. Students in Stillman's lab are now taking a closer look at how seawater acidification may affect adult crabs by stimulating present and future intertidal zone temperature and pH variability in a one-of-a-kind custom aquarium system that they have built at SF State's Romberg Tiburon Center for Environmental Studies. Carter was recently awarded a California Sea Grant State Fellowship at the Ocean Science Trust in Oakland. "As one of my projects, I am helping to establish an Ocean Acidification and Hypoxia Science Panel composed of leading scientists throughout the west coast to synthesize and translate the state of scientific knowledge around these issues for resource and water quality managers," she said. "I am very excited to be a part of this work, and to use my background in ocean acidification research." The new crab studies from Stillman's lab were published in the April 2013 issue of The Journal of Experimental Biology.